This year’s conference expanded to include four keynote speakers, including Crucial Conversations’ Joseph Grenny, and will take place October 18-19, in Charlotte, NC. Rhythm Systems, the market leader for comprehensive cloud-based business planning and execution software, announced today the keynote speaker line-up for their Breakthrough Conference 2016. The conference is designed for mid-market companies that want to take their execution game to the next level. It will take place October 18-19, at the Hilton in Charlotte, NC. The theme of this year’s conference is Breakthrough Team Execution. Attendees will learn how to build and grow a team of “A” players that exceed expectations and drive results. Small working breakout sessions will provide simple tools and insights to help teams break down silos, balance growth initiatives with daily work, increase accountability and communicate to achieve better business results. Rhythm Systems’ CEO and Co-Founder, Patrick Thean, will keynote again this year, along with three new speakers. Patrick shared, “I’m really excited to bring these speakers to you this year. We handpicked all of our speakers to give attendees a well-rounded agenda with actionable tools and concepts they can go home and start implementing right away.” Jay Bloxsom, who attended in 2015, shared that it was "by far the best business conference” his company had been to and that they are implementing a number of new things they learned last year. Rhythm Consultant, Cathy McCullough, has been working with companies on strategy, organizational culture, executive consulting, and leadership team development over the past 25 years. She will teach conference attendees leadership and accountability in her keynote: Becoming an Accountable Leader in 75 Minutes. With high ratings and a packed breakout session in 2015, Rhythm Systems is excited to invite Cathy back as a keynote speaker. The Breakthrough Conference is open to all executives, departmental leaders and team members who want to learn how to accelerate airtight execution within their company. 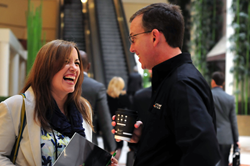 With 90-minute breakout sessions, attendees will have time to work on real, actionable plans for their own businesses. It is encouraged to attend as a group so team members can work together on their actual business. Early bird registration fee is $895 and ends June 30th. Additional group discounts up to $75 off the ticket price will be offered throughout registration. To register, visit: http://www.rhythmsystems.com/breakthrough-conference. The conference is currently seeking sponsors and media partners. To learn more about sponsorship and media packages, contact Alison Brown at alison@rhythmsystems.com. Rhythm Systems is the industry’s only solution that combines complete, cloud-based business execution software along with expert consultants and a library of step-by-step tools to help mid-market companies drive airtight execution so they can achieve their business objectives and long-term success. Founded in 2006, Rhythm Systems has helped hundreds of companies improve team execution, accelerate growth and achieve measurable success. CEO and Co-founder Patrick Thean’s book, Rhythm: How to Achieve Breakthrough Execution and Accelerate Growth, was published in April 2014 and recently hit No. 3 on the Amazon Best Seller Rank for Kindle. For more information, visit http://www.rhythmsystems.com or follow on Twitter @RhythmSystems.